By the time the 1998 free agent signing period opened for business Friday morning, the market resembled a local grocery store on a day when a two-inch snowfall was expected. …Considering only the moves teams made Thursday, the day before the signing period, about two dozen blue-chip players went off the free-agent market. Between "franchise" and "transition" designations and new deals negotiated that day, NFL clubs committed at least $121 million in compensation for 1998. There were new record contracts signed at three different positions. What remains, now that the dust has settled, is a talent pool that represents the weakest "top 30" ever presented by the Journal-Constitution (see chart). The severely diluted Class of '98 still is better than classes of the old "Plan B" system, when, during a three-year period in the late 1980s, clubs overspent for marginal players. But the 1998 class lacks the quality and depth that had been anticipated by personnel men leaguewide. Call it "Plan B-plus" for lack of a better term. "There are some positions now where it's just about tapped out already," Oakland personnel chief Ken Herock said. "You knew some big-name guys would go off the market, but not to this extent. And the (dollar) figures are huge." Nowhere was the impact of the premarket signings more profound than at offensive tackle and defensive tackle, two areas that were supposed to feature a veritable free-agent treasure-trove. Of the nine top-rated defensive tackles, five received "franchise" designations. Eric Swann re-signed in Arizona, and Minnesota star John Randle has a "transition" tag. That left Dana Stubblefield (San Francisco) and Joel Steed (Pittsburgh) as the true quality players at the position. At offensive tackle, the re-signings of Todd Steussie in Minnesota and Bruce Armstrong at New England left the Steelers' John Jackson as the best left tackle and journeyman James Brown the best available right-side tackle. Steussie, in whom the Falcons had an interest, signed a four-year, $22 million deal that includes a $6 million signing bonus and makes him the highest-paid blocker in history. "I played four years to get my freedom, but there was a price at which I'd surrender it, and (the Vikings) paid it," Steussie said. "Being a free agent, out on the market, would have been great, but how much better could I have done, realistically? If this is what indentured servitude is all about, I'll take it." The signing frenzy Thursday was, many veteran observers agreed, one of the most phenomenal things witnessed in the past 20 years. Teams held the threat of the "franchise" designations over the heads of players and agents for forced deals. Since the "franchise" tags are lower than most of the players would command on the open market and don't include any up-front bonuses, players squirmed and then signed. One who called his team's bluff was Baltimore center Wally Williams. Ravens officials offered a choice ---a four-year, $10 million contract or the "franchise" designation, a oneyear tender at $3.052 million. "When he rejected the offer, they wasted no time in putting the `tag' on him," said agent Tom Condon said. The day left agent Neil Cornrich looking like the smartest man in America. 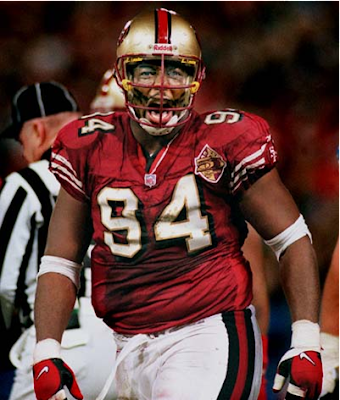 Cornrich represents Stubblefield, arguably the best unrestricted player in the market, and he had included in the previous contract the stipulation that the 49ers could not designate his client as a "franchise" or "transition" player. The "franchise" tag is worth $2.883 million. On the open market, the five-year veteran could command as much as $6 million per year. "You don't think Dana is one happy fellow right now?" Cornrich said.